First Look at Le Néant, the Cocktail Bar That’s Changing Everything in L.A.
Kevin Lee has the best ingredients and doesn’t need a menu at his omakase-style lounge. Bar director Kevin Lee is at Le Néant, mixing some cocktails he’s making for the first time and soon won’t ever serve again. He’s been putting in a staggering amount of work to purposefully create an experience that’s ephemeral at this highly anticipated downtown L.A. bar, which he plans to open in early December. The creation of each cocktail starts weeks in advance with trips to farmers markets in Santa Monica, Torrance, Hollywood, and Pasadena. This is where Lee buys seasonal produce he uses to make all of Le Néant’s different kinds of amaro, bitters, other assorted liqueurs, and vermouth. He says the farmers he patronizes all seem to think he’s a chef as he talks to them about flavors, aromas, and varietals. Le Néant (French for “nothingness”) is a mezzanine lounge upstairs from The Wolves, the buzzing bar Lee opened in September. The Wolves also makes all of its own liqueurs. It seats about 60, and there are long waits to get in most nights, but Lee and owners Al Almeida and Daniel Salin are steadfast about having a bar where you can only get a drink if you’re sitting down. They want a civilized, old-world cocktail experience at their space inside an annex to the storied Alexandria Hotel. Now Lee is really ready to shake things up at Le Néant, which will also seat every single one of its customers. “We’re taking what we do at The Wolves and making it crazier,” he says. At The Wolves, Lee uses a lot of ingredients, like bananas and pineapples, that he can get from distributors instead of a farmers market. It might take him six weeks to make a big batch of amaro for The Wolves. At Le Néant, he makes a smaller batch of liqueur in maybe three weeks, which requires putting in many more ingredients to speed up the process. Le Néant’s plum amaro has nearly 60 ingredients, including cloves, allspice, juniper berries, lavender, citrus peels, and maybe some peaches or strawberries along with a lot of plums and pluots. Lee is always changing what he puts in based on what’s at markets. Unlike The Wolves, the omakase-style Le Néant, with five bar seats and room for about 40 guests total, won’t have a menu. Instead, Lee will give guests a weekly list of perhaps a dozen ingredients like strawberry guavas, Angelina plums, round baby carrots, green grapes, and black truffles. The list will include the source of each ingredient, and that will be all the information provided. Then Lee, who plans to sell tickets for seatings at Le Néant and initially restrict capacity to about 20 guests, and his team will craft cocktail tastings for each customer. They’re happy to customize things if you have preferences, or you can just let them do their thing. Tickets could start at around $50 for two cocktails, plus an aperitif, and you’ll be free to keep ordering drinks until closing time. Beyond cocktails, Lee will offer glasses of different liqueurs and also give guests the option of ultra-premium spirits like Yamazaki 25 that might cost $800 per pour. Guests at Le Néant will be able to order food, like tomato-basil arancini, steak frites, and seafood chitarra, from The Wolves chef Matt Poley’s dinner menu. Le Néant, which will likely only be open a couple nights a week at first, is a place where cocktail aficionados will want to linger because Lee’s drinks are wonderfully balanced. He likes fruit, but his mastery of cocktail ratios means he knows how to offset ingredients that have more natural sweetness. A drink he makes me with fresh green grapes, grape vermouth, grape liqueur, grape air, tangerine bitters, and aromatic bitters illustrates this point. He rarely adds extra sugar to his cocktails. 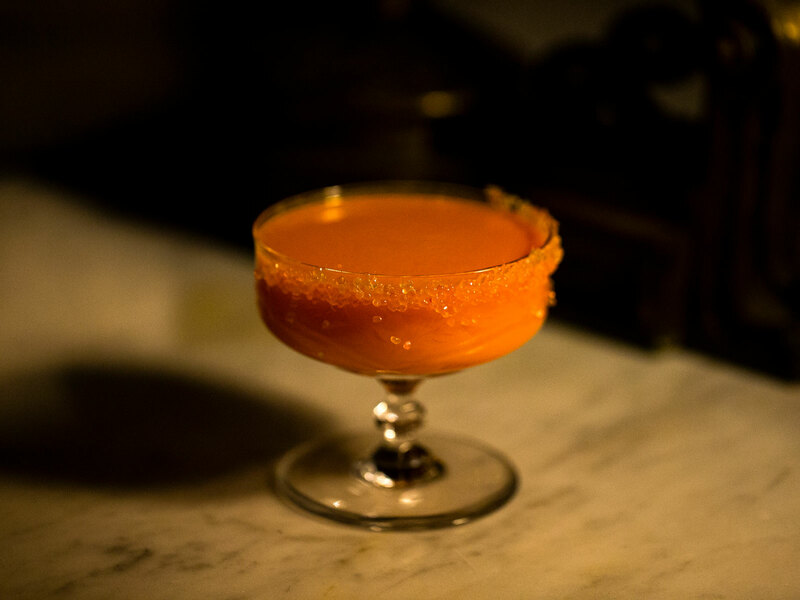 A drink with Asian-pear vermouth, carrot liqueur, habanero bitters, and plum is garnished with little bits of finger lime that are attached to tangerine gel on half the rim. Lee wants every garnish to be more than ornamental, and the finger lime adds lovely tartness and texture. During nearly two hours of previewing the kind of cocktails he’ll have at Le Néant, the mustachioed Lee shakes and stirs and carves an ice ball and torches bitters while wearing a black pin-striped suit, a white shirt, and tortoise-shell glasses. Lee, who is Korean-American, likes to get his suits from Korea and have them tailored in L.A. His appearance might be carefully calibrated, but he feels freer than he’s ever been behind the bar because he’s making drinks on the fly. He’s definitely onto something. I’m dazzled by the umami of golden enoki mushroom amaro and the complexity of flavor that’s imparted from smoked port-barrel chips Lee gets from a friend and how that smokiness intensifies when it sits in a decanter. I enjoy how fig bitters and chestnut bitters makes me long for the holidays. I love how well beet liqueur, beet gel, and blackberry liqueur coexist with bourbon. The crazy thing is, you might never get to taste the exact drinks I’m having. Lee is going to change his ingredients every single week. He doesn’t have a choice, really. “A lot of these are varietals that are going to be gone within the month,” he says. He’s also experimenting with ingredients he’s never used before, like papalo, an extremely fragrant herb he’s putting into a remarkable extra-bitter amaro that works nicely in a Negroni. Lee, as you might have guessed, believes that precision can be the enemy of creativity. It took him a while to arrive at this realization. He used to run Puzzle Bar, a cocktail destination in the suburb of La Mirada. Puzzle was an odd place in a strip-mall business center where everything else went dark at night. The bar served no drinks outside its menu. There were no substitutions. That, Lee says, is “so beautiful.” But while he greatly admires those avant-garde restaurants, this doesn’t mean he wants to do modernist cocktails. What Lee wants his drinks to represent is what seasonal ingredients actually taste like. He’s also been greatly inspired by how vegetable-focused French chef Alain Passard has cooked with ingredients from his own farms while avoiding recipes. “I find that to be pretty rock star,” Lee says. Lee wants to celebrate how things in Los Angeles shouldn’t taste the same throughout the year. He’s studied the history of liquor and understands that amaro and vermouth used to be seasonal. Lee isn’t just changing the recipe of bars in L.A. He’s changing the idea that you even need a recipe at all. And maybe the best way to honor the history of drinking is to look back and consider things like how vermouths used to be prized before prohibition and how they weren’t made with cheap wine back then. Lee is using good wine, including California bottles, for vermouths. Le Néant is meant to a be a transporting place, so Salin tells me about how he found booths from a 1920s café in upstate New York. 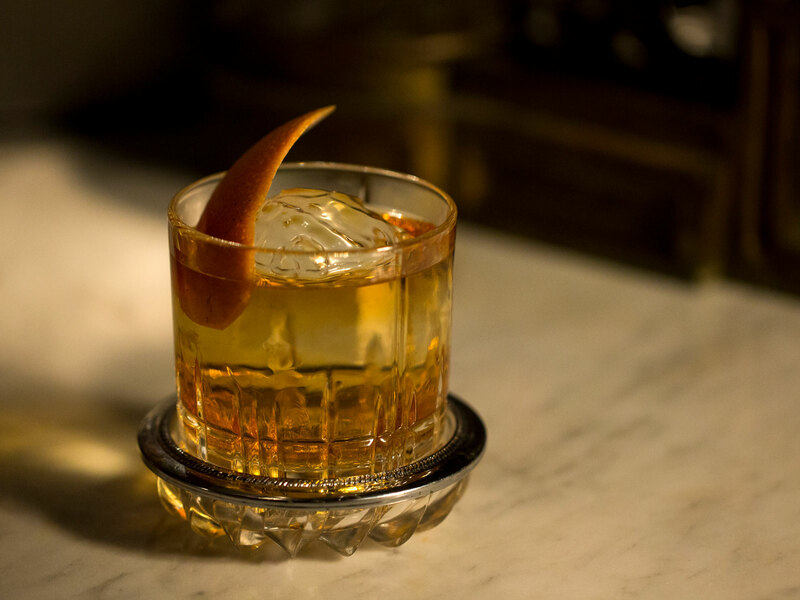 Le Néant’s back bar is from a 1920s New Jersey bar that Almeida’s father bought in the 1970s. President Teddy Roosevelt used to stay at the Alexandria, and Le Néant has a big photograph of him giving a speech. There’s a mahogany ceiling inspired by a old men’s club in Brooklyn’s Greenpoint neighborhood. There are two wooden angels, gilded in gold, that are from Italy and date back more than a century. The angels’ eyelashes are made with real hair. Drinking at Le Néant is like entering a portal to another time, or even another world, but this is also very much a bar built for Los Angeles in 2018, a bar that couldn’t exist anywhere else. Lee might not even know what’s serving you until he starts making the drink.